Though many of Potsdam's Baroque and Rococo buildings were effectively destroyed during and after World War II, the city has always remained nostalgic for them. One such building was the Barberini Palace. Originally built in 1772 on the bank of the Havel river, in 2017 it reopened as an art museum. The architect tasked with the renovation was Thomas Albrecht, partner of Hilmer Sattler Ahlers Albrecht. His responsibility, however, extended beyond the building’s outer walls. With an update of the exuberant bathrooms long overdue, Albrecht opted for GROHE faucet technology to keep the palatial powder rooms fit for a 21st century King or Queen. Or even just an art enthusiast. The washbasins of Museum Barberini are fitted with the electronically activated GROHE Euroeco Cosmopolitan E faucets. This GROHE technology delivers cold or premixed water at the desired temperature of the user. Employing an infrared sensor, water flow is controlled completely contact-free and stops automatically after a pre-programmed running time. This system virtually eliminates bacterial transmission between users and reduces potential water waste too. In applying contemporary solutions to age-old problems, Albrecht has raised the bar when it comes to washbasins for museums. The idea of exhibiting street art in a museum might seem like a paradox. Nevertheless, it was a challenge that the innovative architects at GRAFT welcomed. GRAFT converted the front of a five-story Gründerzeit building into a modular facade. Situated on Bülowstraße in Berlin Schöneberg, the facade is partially interchangeable. This means that pieces can be added to the museum’s collection incredibly easily. A testament to the flexibility and temporary nature of street art in general. The unconventional institution has made a true effort to be accepted by the urban art community. Inside the museum, the entire wall space can be activated either by hanging canvases or using the wall itself. 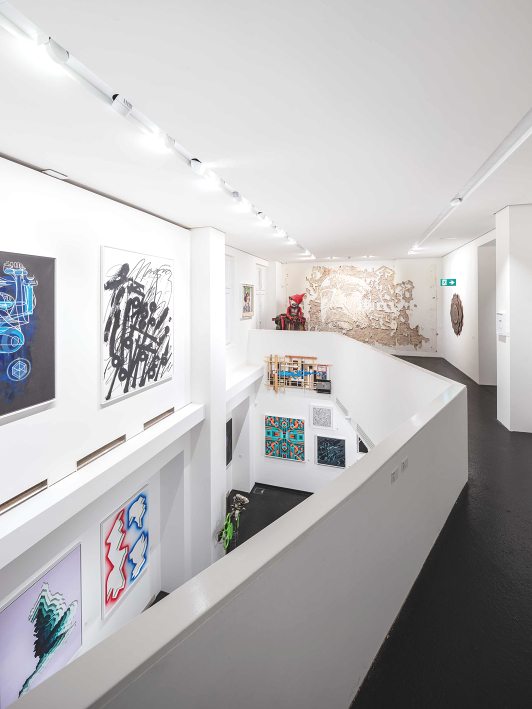 Visitors are also able to experience different perspectives of the artworks in the two-floor exhibition area by making use of an elevated walkway. The contemporary design of the Urban Nation Museum extends into the washrooms, where the washbasins are equipped with hygienic, touchless GROHE Essence E faucets. In addition, GROHE StarLight technology ensures the chrome surfaces are especially resistant to the wear and tear of urban life. GRAFT have forged a future-facing blend of edgy street style and state-of-the-art technology. The Staatsoper on Berlin's famous Unter den Linden has been undergoing extensive renovation since 2009. Along with its director’s building and also its rehearsal center, efforts to revive the opera house are conducted under the careful direction of esteemed architecture firm, HG Merz. “The Staatsoper is one of the most notable examples of architecture from the rebuilding phase of the GDR. It is an important witness of German post-war history,” explained Merz. Daniel Barenboim, the general music director of the Staatsoper, had a more performance-related goal: to improve the auditorium’s acoustics. By raising the ceiling and adding a reverberation gallery, reverb time has been increased from 1.1 to 1.6 seconds. The modernization of the Staatsoper Unter den Linden is delicate a process of physical as well as sonic improvement, and the buildings' revisions don't stop there. The artists’ changing rooms are fitted with Tempesta hand showers and Grohtherm 2000 thermostats. 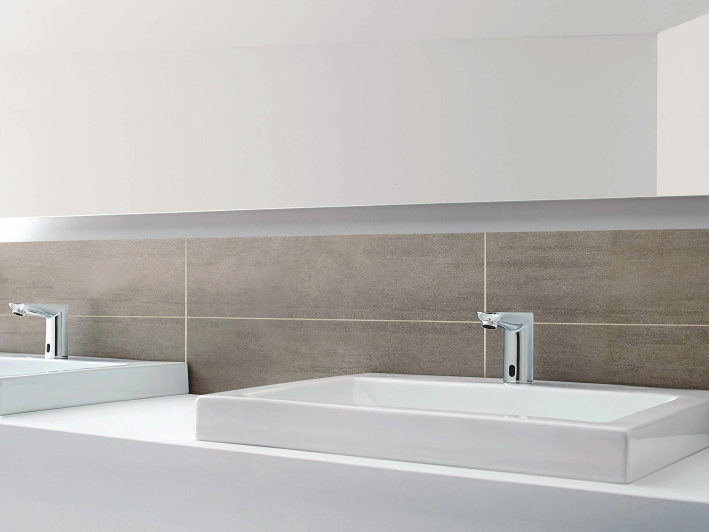 Additionally, within the visitors’ barrier-free washrooms, the upward-contoured lever of the Euroeco Special faucets make them especially easy to use. Durable and classic, GROHE Eurostyle and Europlus faucets withstand the demands of everyday use in the rehearsal rooms and the stage area. With GROHE technology matched with adept renovation, it's a pairing that will echo through the ages. A perfect fit for use by the world’s most famous performers. 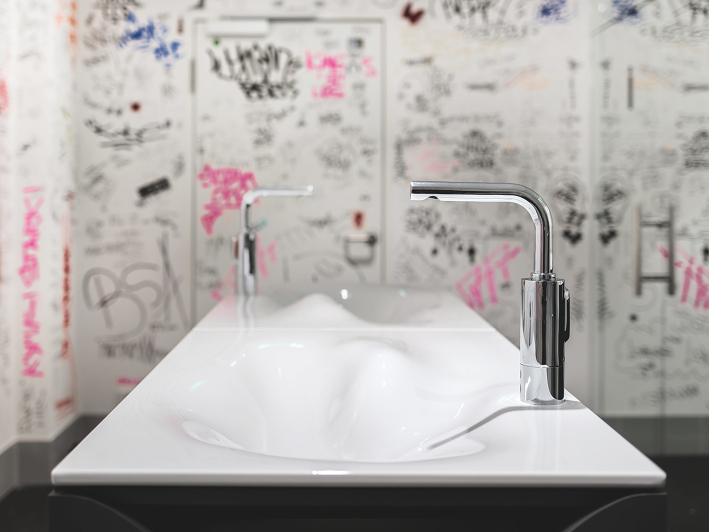 A clean, stylish GROHE Essence E faucet stands in stark juxtaposition against a wall of tags, scribbles and graffiti. 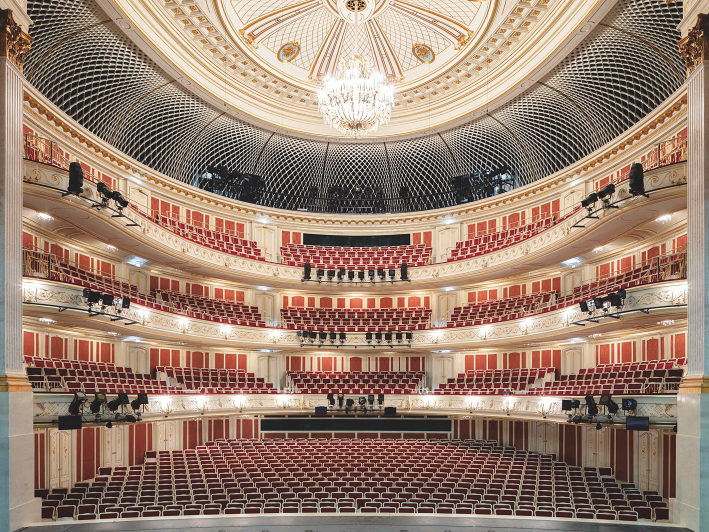 Architecture firm HG Merz began carrying out the renovation of the Staatsoper Unter den Linden in 2009.